This report provides the first comprehensive study of publicly capitalised green investment banks (GIBs), analysing the rationales, mandates and financing activities of this relatively new category of public financial institution. Based on the experience of over a dozen GIBs and GIB-like entities, the report provides a non-prescriptive stock-taking of the diverse ways in which these public institutions are catalysing private investment in low-carbon, climate-resilient infrastructure and other green sectors, with a spotlight on energy efficiency projects. The report also provides practical information to policy makers on how green investment banks are being set up, capitalised and staffed. Green Investment Banks: Innovative Public Financial Institutions Scaling up Private, Low-carbon Investment - This Policy Paper describes the relatively new phenomenon of publicly-capitalised green investment banks and examines why they are being created and how they are mobilising private investment. It draws on the OECD report “Green Investment Banks: Scaling up Private Investment in Low-carbon, Climate-resilient Infrastructure". Release of the OECD report "Green Investment Banks - Scaling up Private Investment in Low-carbon, Climate-resilient Infrastructure" at the Clean Energy Ministerial parallel event “Green banks, green bonds: Clean energy trends for public and private financial institutions”, Westin St. Francis, San Francisco, California; hosted by the U.S. Department of Energy, and featuring the OECD and the Green Bank Network. The event brought together government and finance leaders to discuss how national, subnational and private financial institutions--including green banks--can drive investment in domestic clean energy projects? The discussion considered how such financial institutions can serve as a critical pathway for countries developing strategies for achieving national clean energy and emission reduction targets; and included case studies of recent transactions, including green bond issuances. Investment is growing in renewable energy and energy efficiency, but not quickly enough to get the world on track to achieve zero net greenhouse gas emissions globally by the end of this century. Mobilising investment from the private sector will be essential to meet climate change goals. Governments can find ways to make efficient use of available public funding to mobilise much larger pools of private capital. The report "Green Investment Banks: Scaling up Private Investment in Low-carbon, Climate Resilient Infrastructure aims to provide policy makers with the first comprehensive study of publicly capitalised green investment banks (GIBs), examining the rationales, mandates and financing activities of this relatively new category of public financial institution. It provides a non-prescriptive stock-taking of the diverse ways in which these public institutions are helping to leverage and catalyse private investment in domestic green infrastructure, with a spotlight on energy efficiency projects. Highlighting the role of GIBs within a broader policy framework to mobilise investment, the report also provides practical information to policy makers on how green investment banks are being set up, capitalised and staffed. Many of the investments GIBs mobilise are undertaken in urban areas where 54% of the world’s population lived in 2014, and where 66% is projected to live by 2050. 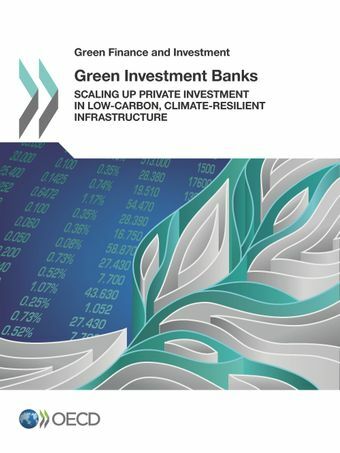 Additional information on the OECD project on Green Investment Banks. For more information, please contact: robert.youngman@oecd.org.